Grilled fish is one of life’s little pleasures. Unfortunately, when you live in an apartment or condo that doesn’t allow grilling, you are left searching for options. Nutrichef recognizing this seldom-answered niche with their PKFG16 Electric Indoor Fish Grill. Right off the bat, the person who named this grill probably doesn’t belong in the Nutrichef marketing department. It can indeed do more than grill fish and seafood. 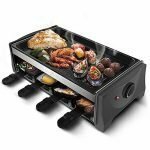 A ribeye steak, chicken tenderloins, pork chops, and even modestly thick bratwursts can all be prepared on this dual element electric grill. It also features a built-in filter system to capture smoke, steam, and fish odors. It doesn’t do it perfectly, but the filter system does work well enough to reduce the chances of your next-door neighbors complaining about the smoky fish smell. Still, stay close to the smoke detector, just in case! Especially if you are cooking something with a lot of excess marinade. 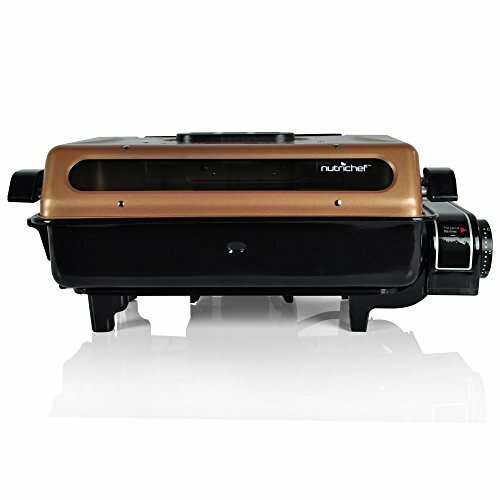 The Nutrichef PKFG16 Electric Indoor Fish Grill has an integrated timer, with an automatic shutoff feature. The instruction booklet comes with a few recipes and basic tips to help you set up and adjust the times for various fish, seafood, and other things you might want to prepare. There is a large, removable drippings tray in the bottom that catches any grease and runoff. It also makes for easy cleanup. 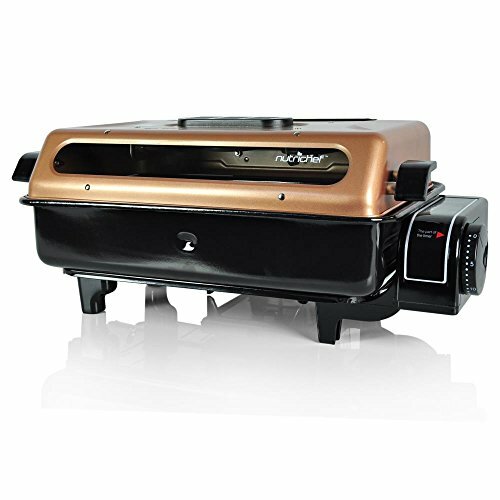 There isn’t much in the way of assembly with the Nutrichef Electric Indoor Fish Grill. You basically unbox it and then set everything into place. Some of the components feel like they are a little on the weak side or cheap side. The top doesn’t have much if anything in the way of insulation, which means it could be a serious burn hazard if you touch it while cooking. Fortunately, the bottom is properly insulated, so it won’t damage your countertops. 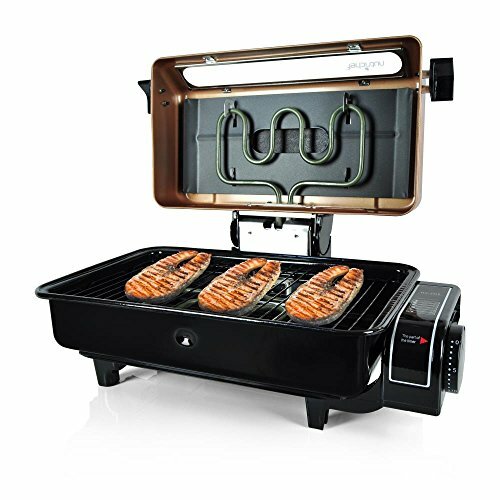 Take note, that the Nutrichef PKFG16 Electric Indoor Fish Grill is not UL or CSA listed. So, you might want to double check with your apartment manager and read the fine printer in your renter’s insurance policy to make sure that an electric grill is allowed. 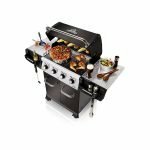 This grill was specifically designed to prepare fish fillets, fish steaks like swordfish cuts, and thin pieces of seafood. One problem that you run into when you cook fish is that it tends to break apart when you flip it. Nutrichef gets around this issue by integrating an electric element into the lid to create a sort of clamshell type of grill. Yet it isn’t designed to directly contact the element, which could be a safety issue with some foods. This is a bit of a double-edged sword because it limits you to thin cuts of meat. When the lid is closed you have a little over an inch of available space. This means that a 2-inch thick tenderloin filet mignon is probably not a good idea for this grill. The adjustable timer is another double-edged sword. You can set it up per the recipes or as you would like and it turns off on its own. This spares you the cliché worry of being out and about and wondering “Did I turn the oven or electric grill, off?” The problem is that if the timing of the recipe is set wrong, you are going to be left with underdone food. You are going to have to accept that it will take you a little while to fully dial it in. The built-in filter is a nice touch, especially if your apartment’s oven hood doesn’t vent directly outside and merely circulates the air. Just keep in mind that it isn’t 100% smokeless or odorless. If you put something on the grill with a lot of excess marinade or a fatty piece of meat, it could still produce enough smoke to set off the smoke alarm. One minor complaint with this grill is that it sometimes struggles to put a perfect sear on a thick cut steak, without first overcooking the interior. The best way around this is to salt the steak 20-minutes before you intend to cook. Then re-wrap it and let it “Bench Rest” or sit out on the counter. This will allow the interior to come up to room temperature, allowing you to then sear the exterior on the grill, yet still have a perfectly pink medium-rare interior. 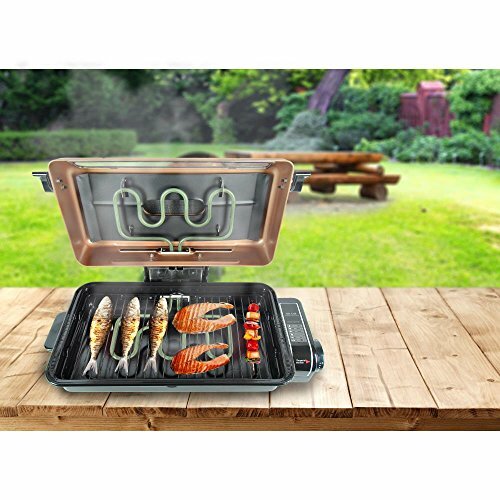 Nutrichef Electric Indoor Fish Grill has a 13.8-inch by 7.3-inch grill grate. This provides you with a little over 100 square inches of grilling space. It’s not large by any stretch of the imagination, which means it can live on your counter or store away easily. With careful placement, you should be able to grill a decent size salmon fillet or say 3 small swordfish steaks. Two ribeye steaks might be pushing the limits. The built-in filter system is nice for reducing smoke and grilled fish odors in a small indoor space. The adjustable timer with shut off switch is nice for making sure things don’t get overcooked. Just give yourself time to get a real feel for it. 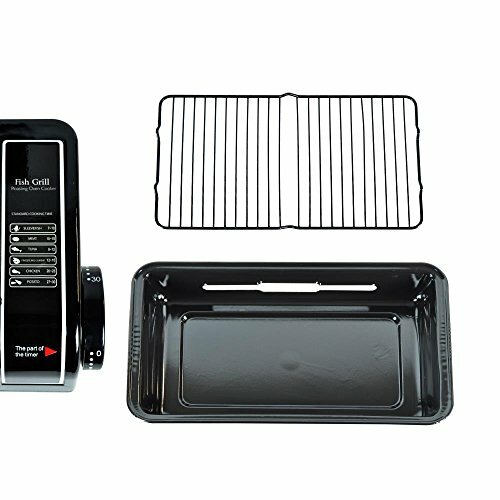 The Nutrichef Electric Indoor Fish Grill is very easy to clean. You simply pull out the drippings tray and dispose of the contents, then give is a gentle wash with warm soapy water. If there’s something stuck on the grate, just scrape it gently with a nylon bristle grill brush. 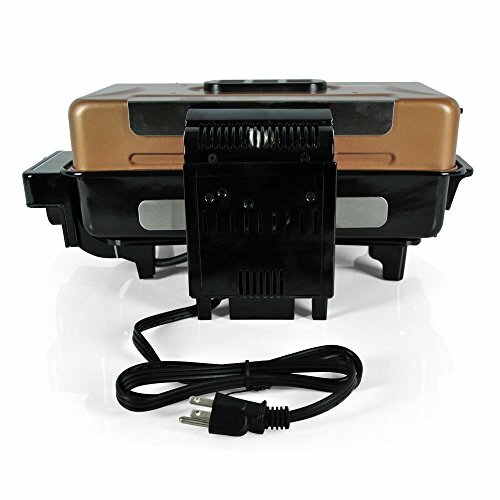 The Nutrichef PKFG16 Electric Indoor Fish Grill comes with a 1-year warranty. 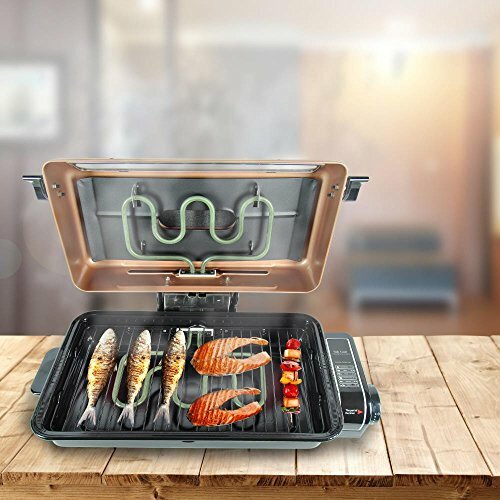 If you love to grill fish and seafood, but you live in an apartment where traditional gas and charcoal grills aren’t allowed, then the Nutrichef Electric Indoor Fish Grill is worth consideration. Just keep in mind that it isn’t designed to be a large volume grill, and it isn’t meant to handle “Thick Cut” meats. AUTO POWER-OFF FUNCTION: Conveniently this electric barbecue comes with a timer that 'dings' when it's done. The timer alarm is important when following seafood recipes. This model has adjustable time and settings for customized quick cook and end period.